The Kindred hide amongst humanity, eking out their bloodthirsty unlives behind a veil of deception. Yet certain mysteries are obscured from even the most canny, perceptive vampires. Who else stalks the Final Nights? What powers do they wield? What hidden skills do they command? 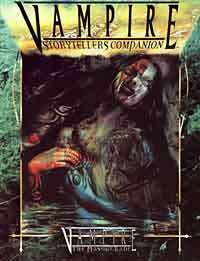 The Vampire Storytellers Companion collects new rules, abilities and bloodlines to aid Storytellers in their task of world-building. This book presents new information on the less numerous Kindred of the World of Darkness, as well as an expanded weapons list and frightening Disciplines only whispered of by the Kindred of the Camarilla and Sabbat. It is a valuable resource for Storytellers who seek to unleash forgotten terrors and new machinations upon their players.